One of the pleasures of writing reviews is never knowing what the year ahead has in store for you. Sure, sometimes it’s an album that you can only get through with gritted teeth, but other times you stumble across an album that makes you wonder how you’ve never managed to hear of such an awesome band. 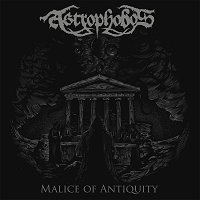 And one such pleasant surprise is the new album by Swedish Black Metal band ASTROPHOBOS, who are back with their sophomore album “Malice of Antiquity”. Starting off the 40-minute-long album is “Fire of Catharsis”, which enters with a ferocious vocal assault. Furious tremolo picked guitar parts and blast beats support the gravely rasped vocals, leading to a veritable audio onslaught. However, this is well tempered by numerous tempo changes and twists in the melody, which make the song catchy as well as fierce. This sets the standards high for the rest of the album, and yet with song after song, ASTROPHOBOS do not fail to deliver. Following on from this is “Begotten in Black”, released as a single last year, and carrying on in the same vein as the opener. Using a clever intro, “Descending Shadows” sees the pace taken down a notch, giving rise to a more menacing melody that adds nice variation to the album. On the other hand, “Abattoir for Flesh and Faith” sees the pace pick up once more, with swirling mid-tempo melodies giving a feeling of desolation as the song waxes and wanes. But it is only in the latter half of the album that the songs really shine. At the pinnacle of the album we have “The Summoning Call”, with its evocative and haunting melodies providing the perfect counter to the harshness that came before. But just before you get too comfortably lulled into its melancholia, “The Wolves Between the Stars” comes ripping in, snarling with a vicious hunger, bringing to mind moments that would not be amiss on a WATAIN album. “Until the Red of Dawn” is another surprise, with a soft acoustic intro shattering into a frenetic song, complete with an artillery of drumming, hair-pin tempo changes that do perhaps get a bit repetitive towards the end. Penultimately we have “The Nourishing Hate” which is perhaps the least interesting of the album, rife with repetition and lacking the diversity of previous songs. Closer “Imperator Noctis” shakes things up a bit once more, with a delicate intro floating in on gossamer wings before the Black Metal riffs kick back in. Distinguishing itself through staged whispers as well as guest vocalist Elisabetta Marchetti, whose operatic vocals add an interesting background counter to the instruments, this song gives us one more glimpse of the fray before slowly ebbing out. Overall, Black Metal is a well-trodden genre, with not much new or innovative music in recent years. Here, ASTROPHOBE is no exception, and by no means reinvent the wheel. But then again, they do not need to. Whilst they do not redefine the genre in any way, neither are they content to just churn out the same recycled melodies so commonly seen in Black Metal these days. The album packs quite a bit of melody and creativity, with the production being clear enough to let this shine through without sacrificing the ferociousness. This is a definite must-listen-to for fans of the more Melodic side of Black Metal. But don't let this description fool you: the band still manage to pack more than enough explosiveness into "Malice of Antiquity".